Succulent Rosemary Garlic Pork Roast that’s perfect for a Sunday dinner or a special occasion, delicious and quick to prepare! Always a crowd pleaser! Here in Calgary it’s winter already, we’ve just had a lot of snow over the last weekend and it already feels like the holidays are here, especially when I go out shopping and all the stores have all the Christmas decorations out already. I love this time of the year, I love all the decorations and this is the only time of the year I don’t mind snow. But as soon as January 1st hits, I’m ready for summer. Now what better way to make it feel like the holidays are here than pork roast? I have to admit I don’t make pork roast that often, but if I do it has to be for a Sunday dinner or a special occasion. The thing I love about making pork roast is how good it smells in the house. Hubs was out shopping when I was making this and when he came back he said he could smell this all the way outside by his car. Rosemary and thyme are great herbs that go really nice on a pork roast which is why I made a rub with lots of rosemary and thyme, some parsley, lots of garlic and a bit of red pepper flakes. I first shared this recipe with you guys about 6 years ago and the only thing I changed now is that I decided to sear the meat first on all sides, to lock in those flavors and get a nice crust on the outside of the pork. I topped the pork with lots of garlic cloves, which is totally optional. 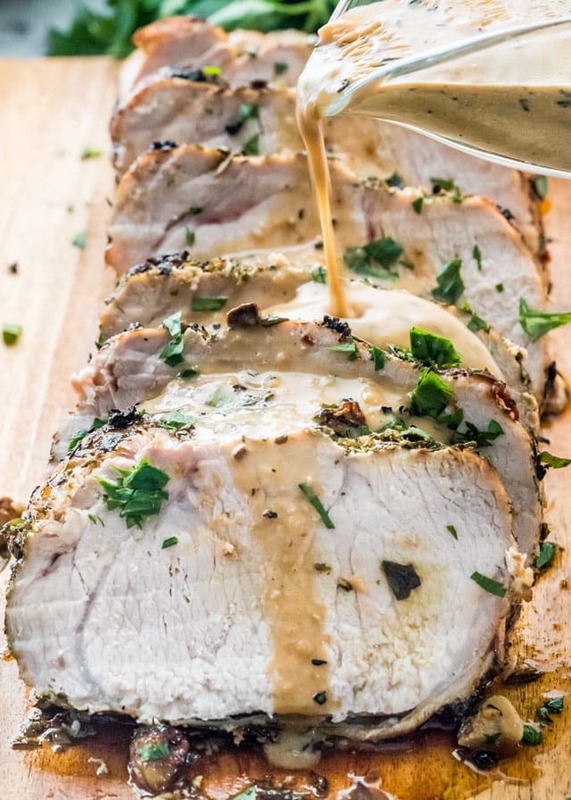 If you’re like my mom you will probably want to stuff the pork loin with garlic, basically cut slits into the meat on the fatty side and stuff the garlic cloves inside. 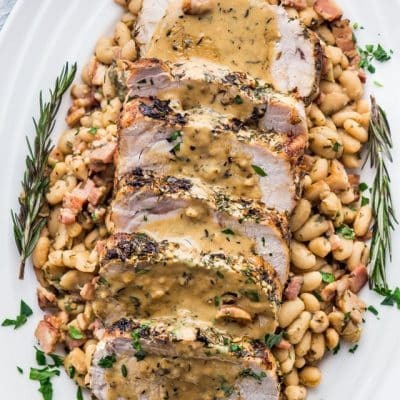 I served this pork roast with some yummy beans that are also loaded with lots of herbs and bacon and so delicious, they went perfectly with this pork. 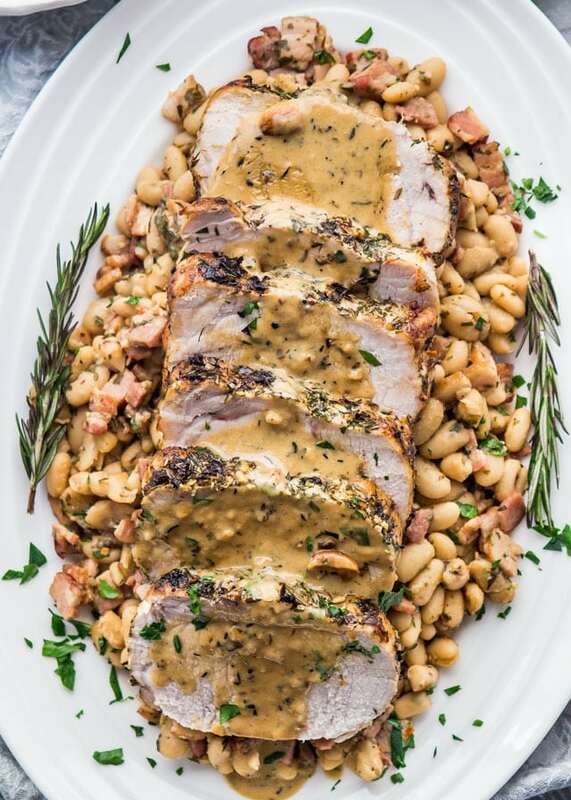 Hope you try this rosemary garlic pork roast, it’s so perfect for family dinners, special occasions or sometimes because you just feel like making something nice. 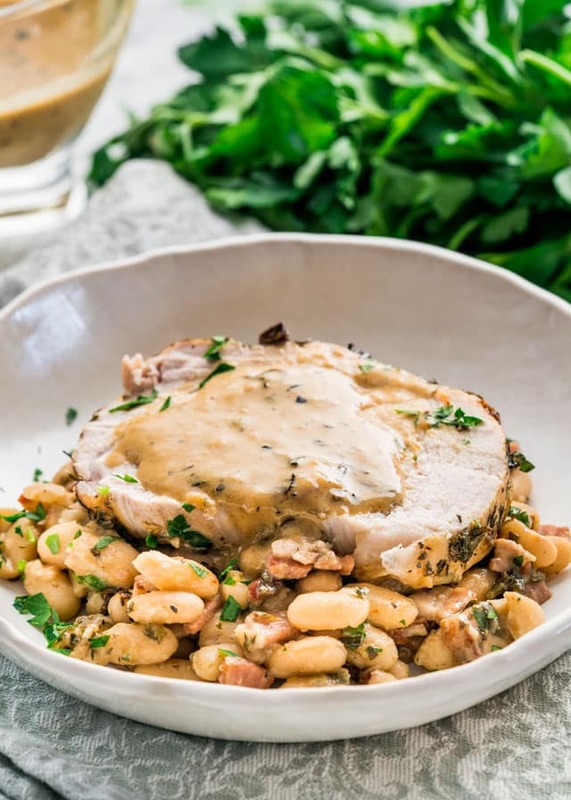 Succulent Rosemary Garlic Pork Roast that's perfect for a Sunday dinner or a special occasion, delicious and quick to prepare! Always a crowd pleaser! In a small bowl whisk together the olive oil with the thyme, rosemary, garlic, red pepper flakes, parsley, salt and pepper. Spray a skillet that's oven safe with cooking spray. Place the pork loin in the skillet and rub the pork with the rosemary garlic rub thoroughly. Sear the pork over high heat on all sides until nicely browned. Top with more garlic cloves if preferred and add garlic bulbs to the skillet. Roast uncovered for 70 to 80 minutes or until the internal temperature of the pork is at least 145F/62.8C to 155F/68.3C. Remove the skillet from the oven and place the pork on a cutting board. Cover the meat completely with aluminum foil and let it rest for 15 minutes before cutting it and serving it. To make a gravy, add 2 tbsp of butter to the skillet and melt. Sprinkle about 2 tbsp of flour and whisk it all together with the butter. Pour about 3/4 cup chicken broth to the skillet and bring to a boil, whisking until smooth and cook for a couple minutes. Stir in about 1/2 cup of heavy cream. Note that you can strain the gravy to remove the herbs and make it into a smoother gravy, but I actually preferred the leftover herbs in the gravy for extra flavor. You can use a pork loin with bone in or boneless as I used it. If your pork is a bigger piece you might need to cook it a bit longer. Easily my husbands favourite dish that I make and the best. I’ve made it multiple times just for our dinners and when having people over, and currently making 4 for our big Easter get together! Maybe I missed it, but did you work the roasted garlic bulbs into the gravy? Of course, after removing the skins, lol. I’m sure it could go either way, unless that amount would be overwhelming, even to us garlic lovers. But, roasted garlic is too delish to just pitch it. We are making this for Easter dinner. Can’t wait. We always love the combo of pork, garlic, rosemary, herbs, etc. Thanks! Since our garlic bulbs weren’t wrapped in foil, they don’t come out of the oven soft. You can always wrap then up if you like so they’re usable in your gravy! My family loved this. It is by far our favorite pork roast. This was easy and delicious. I made it with the beans you suggested and it went great together.